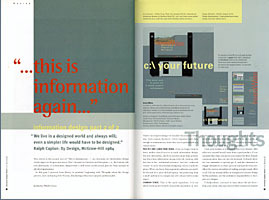 This article is the second part of "This is Information...", my discourse on information design which began in the previous issue. Part 1 focused on Creation and Reception, i.e., the human side and philosophy of information design -- Part 2 will focus on the actual process from concept to physical appearance. In this part I proceed from theory to practice -- beginning with Thoughts about the design process, and continuing with Process, illustrating with actual samples and examples. There's no "recipe" to design -- it wouldn't be creative if there was. Some issues, however, I find important and clear enough to communicate, since they can be generalized to a certain extent. Practice and learn from doing. If you no longer want to learn, neither should you try to teach. Information design, like any interaction, involves practice more than preaching. Since true information design is for all, working with the idea of the "unlimited audience" and the "unbiased viewer" is more helpful than designing toward a specific group. What you learn from a general audience can easily be focused for a more defined group, but projecting from a small audience to a larger one will always fail in some aspect. This is the main ingredient. It is not about studying the breadth of possible perception in your audience, but about making yourself one of them. This includes frequently detaching yourself from your work, as if you saw it for the first time. You must try to share their motivation, and work with their limitations. Treat your readers as you would like to be treated: Offer what you yourself would want from a good product. If you can make that clear, you prove your respect for them. Simple communication does not have to be dumb. It should allow the less interested to quickly get it, and the interested to engage themselves: in short, provide multiple-level access. Allow for various intensities of reading, and give equal effort to all. It is our responsibility as designers to connect things for the audience, not the audience's responsibility to decipher our designs. There's nothing wrong about emotion in design. Emotion may be aroused by any content; but allow your audience to find that on their own. "Making" them feel a specific emotion is manipulative. Sadly, education already seems to have acquired the shape of entertainment, but sprinkling sugar on a dish won't improve the content. "Smart" revenue-generation like infotainment, advertorials and other snake oil is short-lived, and the public will quickly see it for what it is. To build credibility, respect and maintain the integrity of your information. Information should be offered, not imposed. This approach will stimulate a true motivation to learn. True learning is voluntary, and a motivated audience will find their own best way to learn -- if you let them. The project's success should rely on the viewer, and be based on understanding -- since rote learning is nothing more than slavery. Once you've come up with something new, test it to reduce risks. Total safety never exists -- and still, our race has somehow progressed, although market research has not yet been able to discover the limits of what people cannot know. Information design may seem unattractive work exactly because it has to look simple to all -- as if effortless. Many designers take a removed position, assuming there's no space for self-expression, which makes information design seem unrewarding. Certainly, information design is a service -- but an artful one. There's no single solution, as there's no perfectly objective information. Any design decision is a personal choice, just as all creativity is to an extent personal: any two equally qualified designers will ocme up with two different solutions -- but equally valid ones. Finding out what you can make out of an unknown problem will tell you how your own mind works, and who you really can be. This potential is the most original form of self-expression. means not only that concept, structure and components receive the same attention and spirit -- it means that your audience can approach all your products in the same way, ad can go with them through upgrades over time. "Constancy" might be a better term for the underlying attitude nurturing both flexibility and consistency, and the possibility to expand a philosophy in the same spirit -- as, for example, in extending your work to different cultures, the essential thinking underlying communication is the same across all media, and desirably so. And the underlying concepts from digital, printed, spatial and other media can and should influence each other. Every project is new, the problems different -- experience is relative, and so is imagination. "Vision" is limited. Nobody can imagine all the surprises a design process has in store. I can't, and that is actually the fun in it. Anything that smells of recipe can't be more than a guideline or suggestion for interpretation, leading to your own way. Try not to imagine anything, but concentrate on one step after the other. You may be surprised about the outcome, and learn more about your real potential than you had imagined. Don't fall in love with your ideas, but don't be insecure about them. Acquiring a distance from your intellectual property is an effort -- but try to detach yourself from your brainchild once it's on paper. Prototyping: Testing should take place early and often, but economically -- especially at the beginning when many different ideas have to be tried. The audience should be as diverse as possible; start with friends, colleagues, relatives etc., but then move on. Include oyur sales force soon; they will have to defend and sell your model and its implications. "Form follows function" used to describe a useful sequence -- not a credo -- inside long-defined media that could take their requirements for granted. The new media admittedly have flaws where the old excel, but their form is so open and their possible effects so unproven, they may engender a host of new functionalities before conventions have been codified. Any approach has to come out of medium, content and context.These define general limits and guideposts around which to create the weave that will organize content. Would you first build any shelf, or rather first measure the items the shelf has to hold? If I devise structure before content, the structure will become an obstacle. In brief, the road to my destination I also have to design. As it is only logical to start with the most complex part of a project, it seems equally clear that, in a multidisciplinary project, work should be begun in the most complex medium, i.e., the most interactive one. Print can well learn, and even be rethought, from CD-ROM. Conversely, beefing up an existing print piece into a CD may leave the original linear structure blindly untouched and unexposed to the inherently different conceptual possibilities of digital media. Information design makes the flaws in the content obvious. Such flaws are only natural since no single part of the team can do the entire job alone. Designers, writers and content developers have to go back and forth, criticizing each other and suggesting adjustments along the way. This is certainly more demanding for all participants in the process. In fact, it goes totally against the traditional workflow of 1)content finished, 2) copy finished, 3) layout finished and 4) style finished. It is mentally abrasive for people who'd rather settle in the traditional workflow; it requires constant awareness no matter how long the process takes. Results are less proprietary; there's no single creator or owner anymore. Since information design connects factrs, topics and issues to promote larger understanding, projects are typically complex and extended. The complexity of information design projects is growing through a more international market and improving communication technologies. The first thing to do is to question a given assignment in a few major aspects -- to run your own checklist after the initial briefing. > Can you relate to concept and project well enough to give it an energy level that will satisfy both you and the client? > Is the message worth knowing about? > Is the medium appropriate for the content and for the audience? > Does the workflow allow for exchange and feedback? > Is the structure acceptable and open to improvement? If you have reasonable doubts, express them and suggest alternatives or improvements. This is not only the most truthful test for your solutions, but may also lead you out of creative dead-ends. Occasionally, hold your designs to a mirror, or upside-down; reverse images from positive to negative on the screen, or even imagine your approach and process turned backwards. Search and bring out the interesting aspects from inside the project, rather than imposing external design devices to elicit emptional interest. The content needs the best chance to speak for itself. If it seems boring, ask for more interesting content. Most media are still structured in a linear fashion that hides conceptual and contextual relationships. Try to find some way to incorporate interactivity into your product. This is possible in all media. Interactivity is choice: Let the user have choices, engage him in his own action, encourage curiosity, exploration and learning, offer options to customize and personalize the medium. While developing the theoretical shell, collect ideas for new features that offer inspiration -- both for you and for the audience. Start with the most difficult part -- the most space-consuming or hardest-to-figure-out concept. Once the worst-case scenario is resolved, everything els will almost fall into place. If you develop your project from its toughest knot, you may be surprised how the remaining content, once liberated, will unfold its plurality inside your new structure. "An amazing diversity comes out of standardization." (Caplan). <Content>, which is the scope or body of information. <Metaphors> compare new tasks or procedures to those you know (as in "user-friendly" interfaces). The <cognitive model> is the greater order in which your product is organized to facilitate access. <Navigation> comprizes the substructure of indicators pointing you in the right direction. <Look>, or the appealing composition of all elements into an aesthetic whole. <Feel>, or feedback which the user receives from your product, and also the effect on the user -- his reaction, your success. should mean that the audience can perceive the content as building blocks -- digestible in small portions but also related as a whole. Read your copy carefully and break it up into more digestible pieces, while indicating their hierarchy by graphic treatment. It is proven that most text is usually not read in a linear fashion, but the smallest chunks first. The obvious interest in browsing, observed and fostered by interactive media, might have its roots in a much older attitude towards print -- in the same spirit, also break listings into shorter sections, and find labels for them. <Short subtitles> in bold type are one of many treatments that help the reader scan a page more easily -- and also find a certain paragraph or section again to read it a second time, quote or refer to it, enriching the learning process. <Hypertext> features provide not just one new level of information, but can be grouped again into different kinds of building blocks indicating alternative choices, drill-downs, cross references, marginalia and more. <Captions> to illustrations are the most unjustly underrated information carriers, Even the most superficial browser will read a short caption to a striking image. As a combination of word and image, they are much more memorable for their conciseness than content nested in (and camouflaged by) the running copy. Captions should never state the already obvious, but provide additional information. They should always be directly attached, not tucked into a corner and referenced by numbers. Style can be used not only to organize content but also to give it a structure that is clear and approachable. needs to reflect structure and hierarchy. But it's more than order -- there are aesthetic possibilities inside the structure of all information. Inviting appearance adds value, respects the user's eye, and is remembered more gladly. It also sends a message that the content owner -- your client -- cares. This approach I'd like to call "integrated aesthetics": making the most out of the least. All design elements used are necessary and appropriate, but carefully devised and appealing. The result will be concentrated and economical, not only visually but on your budget as well. From every project result new problems, then new solutions -- in new styles. New tools will do the same: The better examples of computer design clearly resulted from exploring what's new and better in it -- not from falling for "that computer look." Book covers, CD-ROM sleeves and title screens can be a painful issue for informaqtion designers. Many covers and packaging have literaqlly nothing to do with the inside design. Compared to content-bearing pages, a cover may seem easy to design, thus enticing more people to participate in its creation. Many a good content has been hidden by an over-contrived cover that lacked a unified voice. It is only logical that the cover should be designed the content, so that it can profit from and display the quality that resides beneath it. Yet, the cover often has to be advertized early, while the content is still in the works. To overcome such real-world problems, any alternative has to be really convincing. Put your cover to work! Rather than promises, it should feature useful and well-designed devices such as a table of contents, a map, a chart etc., so one can use the book without even opening it. The same applies to back and inside covers. Pack information there that is used most often. Flaps that fold out can serve both as bookmarks and as reference cards, ans seen in many computer manuals. This approach can also build brand recognition and establish an identity over time. To any regular book page or interactive screen, the same applies: across a given section, some elements change and some stay the same. Typically, information media are often rather dense and therefore need a bolder treatment for elements that indicate structure and order. Especially helpful in print are items that bleed off the edge of the paper, so they show even when the book is closed. have to serve the content, and be open enough for all possible situations. Many classic design books recommend grids, but don't explain how they should work. Grids should always be "customized". A grid should be developed after, and according to, the elements that have to go inside. This may result in surprising proportions but will allow for a more natural composition that may become part of the product's identity. Space is not just empty; it has a range of functions just like air. It is clean and appealing, and prevents clutter. Space is active as it points to the printed elements; it separates them in a simpler way than other devices can. And the white of the page is as much a color as the black of the ink. Playing with positive vs. negative or knocking elements out of printed areas will make them glow. I am convinced that any layperson could sort typefaces between "informative" and "entertaining/emotional". This is a true asset for communicating what your content is about. On the other hand, it's unlikely that an average audience recognizes the difference between more than two typefaces within one piece. Serif versus Sans seems too subtle for most. Research has shown that Bold vs. Light is clearer -- for their different values of color. Other efficient treatments include color, type knocked out of the background, or lines and bars (...where less is certainly more). Italics are good for subordinate purposes, such as indicating technical or foreign terms. Obvious differences in type will help maintain the integrity of your design. Many may consider and use color as a purely emotional device, which is sadly limited. Color is an important dimension of information: its immediacy can be put to work without necessarily emotionalizing content. Primary colors have signal character and work well at the highest levels of a hierarchy. Lower levels could receive gradually less prominent "background" colors, or become consistently brighter or darker, or more grayed-out. Simple colors have simler names, too. "Go to the blue floor" is clearer than "Find the aubergine level". Pretentiousness has no place where common terminology would better serve the content. Try to be as visual as possible, but only where appropriate. The overall tendency is shifting away from text and toward graphics, but not always toward greater clarity. The past decade's icon-mania has led to many pictogram systems that are less understandable than simple words. If you need symbols or icons, they should convey an immediate message where words are too much or too little. Keep up with the times, but avoid short-lived fads: use what makes long-term sense in your publication. Bring all elements into proportional correlation. Present related or comparable graphics at the same scale, rather than forcing them to fit. Direct labeling is preferable to any color- or number-coding system. Give bar charts preference over pie charts; bar lengths are easier to compare than angles in a circle. Very special thanks to Thom Grizzard and Greg Galle, to Bobbi Long, and to all my friends who helped me get this far. The human side of information design: Creation and Reception. at Wells Fargo Nikko I.A. even a simpler life would have to be designed."